There was a time when something like Criminal would have reigned supreme at the box office and likely been heralded to some degree as unique in its premise if not necessarily successful in its execution, but in this day and age not only is Criminal not fresh or unique, but it's extremely tried and rote. I don't know that there was a time when Kevin Costner was a box office gold type name on the poster, but there was certainly a time when Costner was considered a surefire movie star that would at least guarantee a certain number of butts in seats. It seems, at least from what I hear of the movie star heyday, that there was a time Costner could have more or less played this same role in the same movie and it would have been a much buzzier film with bigger box office prospects based off his name alone (not to mention co-stars Gary Oldman and Tommy Lee Jones being value add elements). Unfortunately for Costner this is not the world we live in anymore. Instead, we live in a world where the best hope you have of becoming something even resembling a cultural phenomenon is being based off a comic book, young adult literary series, or have any other type of brand recognition/nostalgia factor you can tap into. 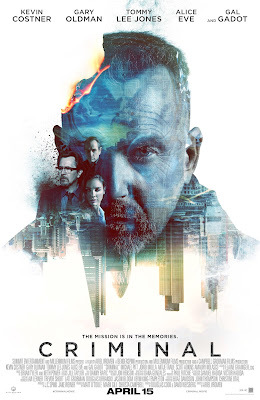 When it comes to original action dramas like Criminal though, chances are slim of anything greater coming of your efforts unless you have David Fincher behind the camera. All of that said, this is a movie that squanders any potential it might have had at being an exception to the rule by adhering to very little coherence and even less logic. Truth is, I wanted to enjoy Criminal-I wanted to dig into it like the fictionalized Dateline episode I expected/hoped it would be and get wrapped up in the sci-fi tinged mystery that it presented, but instead the film plods along at an unusually clunky pace, never deciding what type of movie it wants to be yet appearing very obviously to be a very specific type of movie from the cast, narrative, and creative team alone. It's not that Criminal is necessarily a terrible movie, though it has some terrible parts, but it is most certainly not a good movie and even worse is it's not even a movie worth watching passively. To be completely honest, I'm still not sure what to make of the plot for this film. Upon first seeing the trailer I was of two minds; either this was going to hold some cool potential given the cast and the old school style it seemed to be mimicking or it could simply be little more than an off-shoot sequel to last years Self/less (also starring Ryan Reynolds) that would wind up being as irrelevant and inconsequential as that film. Unfortunately for us, but most unfortunate for Reynolds, is that Criminal will undoubtedly end up in the latter category. The film begins by introducing us to CIA agent Bill Pope (Reynolds) who is on a mission in Germany tracking down a shadowy hacker nicknamed "The Dutchman" (heard that one before?). It's not a spoiler that Pope is done away with rather early in the film as it is his death that the rest of the plot hinges on, but when he is swiftly killed by another raging lunatic of a hacker called Xavier Heimdahl (stock bad guy Jordi Mollà) that doesn't mean his knowledge must die with him. In fact, his superior Quaker Wells (Oldman) along with peers Marta Lynch (Alice Eve) and Esteban Ruiza (an underused Amaury Nolasco) hold the information Pope knew at so high a level they are willing to conduct an experimental procedure performed by a veteran doctor known as Franks (Jones) that can potentially transfer Pope's memories to that of the mind of dangerous ex-convict Jericho Stewart (Costner). Why a dangerous ex-convict? That part is actually rather interesting as Costner's character was subject to severe head trauma as a child essentially shutting down the part of his brain that disabled him from recognizing emotions or being able to tell the difference between right and wrong. Thus, the reason he is a convict, but under these circumstances that we're told a statistic about that makes it sound incredibly rare, he is one of their few ideal candidates. It is when Jericho wakes up with Pope's memories interfering with his own that Wells and the rest of his team set about forcing Jericho to track down The Dutchman (Michael Pitt) before he and Heimdahl start some type of worldwide rebellion. Dangerous convict (Jericho Stewart (Kevin Costner) is escorted from the operating table where he was given a new set of memories. Of course, what makes Criminal so disparaging is the fact it squanders all of the potential it holds. The Iceman director Ariel Vromen certainly seems to have attempted to replicate the tone of certain nineties action thrillers (with Brian Tyler's score only reinforcing this) while also hoping to put a different, more timely spin on the material, but it just doesn't gel and I have to believe much of that is due to the fault of the script. Written by David Weisberg and Douglas Cook (The Rock, Double Jeopardy) who had their hands in a large number of 90's thrillers one would imagine Criminal to be along the same lines, but rather it feels as if both writers are out of their element, trying to fit what they know into something new. The premise is more grounded in reality than Reynolds other brain swapping actioner and the violence goes to some pretty extreme lengths, but these interesting and edgy facets don't allow for a cohesive or even entertaining movie. And that's all Criminal really needed to be was entertaining. It needed to be a whodunit chase film with a villain that actually received some character development that audiences would root for Costner's Jericho to dispatch, but while Costner is doing his best Tom Hardy impression as the disillusioned and confused "protagonist" there is nothing especially appealing about his character and no urgency that motivates him to go after what the CIA needs other than a bag of money that is only loosely connected to the whole Dutchman/Heimdahl deal. As for the rest of the cast, Jones is going through the motions for some old friends, Oldman is reduced to yelling nonsensically, and poor Gal Gadot, as Pope's widowed wife, is offers the only source of genuine emotion in the film as she deals with trying to piece together hearing her husbands consciousness come out through another mans mouth. Costner, Gadot, and Lara Decaro who plays Bill and Jill's daughter, Emma, have a few moving and insightful scenes together regarding the still engaging premise, but the remainder of the movie around them can't help but to take such moments for granted.